Revian.org is a blockchain-based review platform with a goal to bring back people’s trust in online reviews. It’s a new generation feedback platform that doesn’t allow changing or deleting reviews and its authors get a reward for creating it. Revain also uses AI technology, IBM Watson, to filter out poor quality or dishonest reviews, all of which is transparently viewable on the Revain blockchain. Revain review platform for crypto community has listed BITCORE. Please let’s write some reviews about BTX. 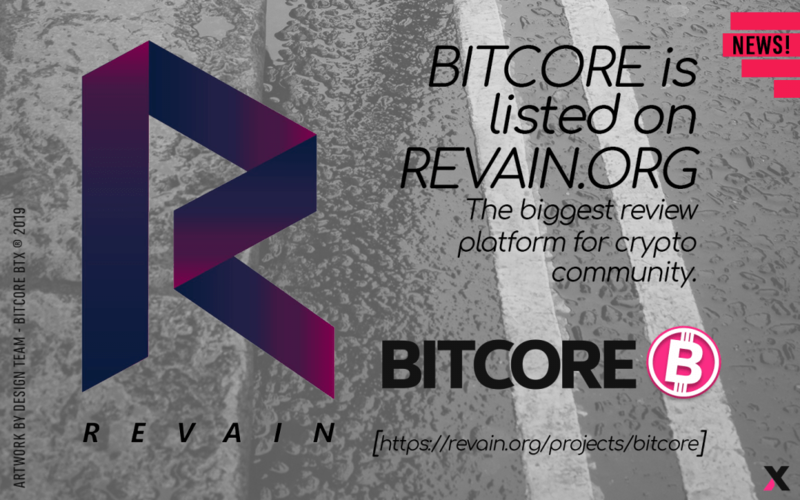 https://revain.org/projects/bitcore​. To leave your first review just type “BITCORE” in the search bar and share your experience with crypto community! Writing high-quality reviews not only helps BTX project to receive authentic feedback, but also gives you the weight in the crypto community eyes.